Khalid Abdullah has sold Exosphere to Australian interests. Now what would you rename him ? 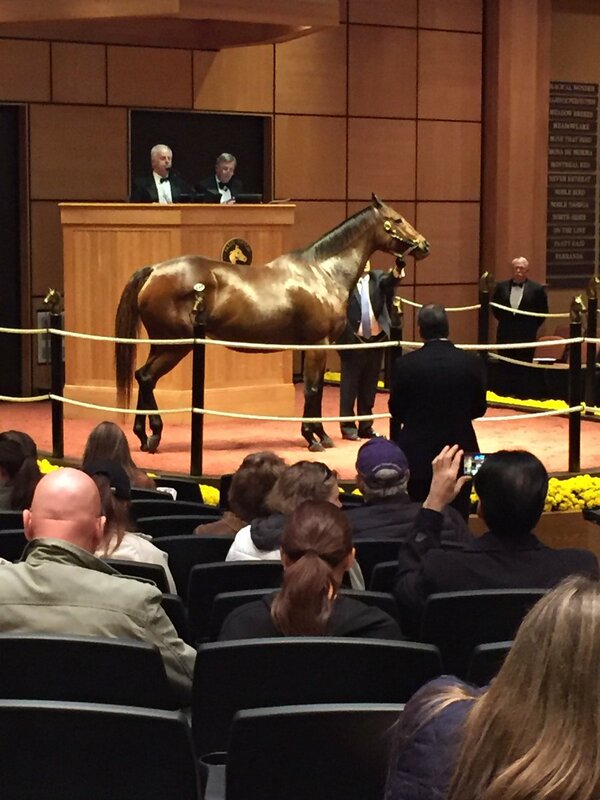 Mum sells today at Fasig-Tipton. Not exactly sure what this means ? Did not sell ? California Chrome's mum made $1.95m ift to Tapit. Well, if this is the answer then it’s easy to understand why people should so often end up having asked themselves the wrong question. Here she is, arguably the greatest broodmare of the modern era; certainly one of the most accomplished in the long history of the thoroughbred. And she looks as though she has wintered among the fjords. Hasili’s mane hangs down her neck in long sheaves. Ed Murrell, assistant manager at Banstead Manor Stud in Newmarket, ploughs an affectionate hand through the shaggy coat over her ribs and a clot of faded hair idles to the ground, trailed through the soft spring sunshine by a faint spindrift of powdered mud. It might have been torn from the stuffing of a sofa and, when her visitors have gone, perhaps some fortunate crow will carry it off as wattle for a nest. Five Group 1 winners, but such lowly rearing is all Hasili can be party to now. You look her in the eye. Perhaps there is something of the mystery to be read there, in those rheumy dark pools. But no. The look of eagles? Hardly. She gazes back, calm and patient and knowing, from a lagoon long separated from the high tides of youth. She was 26 eight days ago. But the old lady is healthy, cherished and ever in the best of hands. And the whole setting is Elysian: the warmest afternoon of the year so far, sap renewing in the trees around the paddock. The tearing of grass, as her three companions lose their curiosity, only serves to measure and deepen an absolute peace; likewise the notes of astonished gladness in the birdsong. Another winter survived. Besides, her legacy is guaranteed; her name already immortal. The visit is prompted by a historic photograph – and by the questions it raises for anyone fascinated by the riddles of breeding, from the game’s sagest old hands right down, in this instance, to the new bloodstock editor on whose desk it landed. 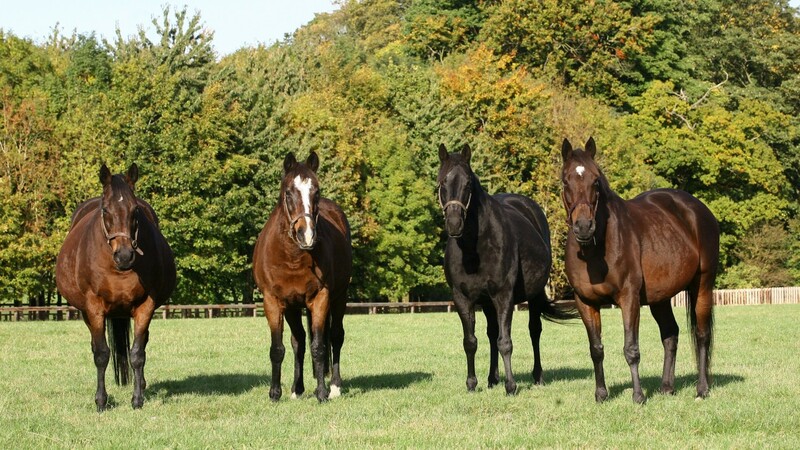 Published here for the first time, though tracing back to the end of a summer at grass, it shows Hasili reunited with her three Group 1-winning daughters: Banks Hill, Heat Haze and Intercontinental. A tableau that permits no doubt – no matter how often we are confounded by the anomalous outcomes of matings – that workable principles must be operating, at some level, in the selective breeding of racehorses. Yes, there are times when a sprinter will sire a Derby winner, and vice versa. And yes, there are many times when a champion male and champion female will together produce only a feeble, inveterate loser. But then you look at Hasili, dam of five elite winners plus one who was better than them all, in Dansili. You look at the dynasty now extending through her sons and daughters and you know the grail cannot be illusory. That does not render it any less elusive, of course. Even in her pomp, nobody would have known Hasili as a mare in a million. In fact Simon Mockridge remembers the day a couple of agents could not even pick her out from a group of five, with foals at foot, in a paddock adjacent to the Juddmonte offices. “She’s a plain Jane, a nondescript mare,” the stud director shrugs. “But if she’s an ordinary mare, she’s done extraordinary things. And actually if you stand her up and break her down, she is incredibly well made. Very good angulation, very sound. She doesn’t look overly robust, but she has good bone for her size and she’s nice and square. If the eugenic principles driving the industry are going to make sense anywhere, of course, it will be here at Juddmonte – source of more than 100 homebred Group 1 winners for Prince Khalid Abdullah over the past 35 years. And Mockridge stresses that the whole dynasty is rooted, first and foremost, in the Prince’s passion and vision. Sure enough, Hasili’s family has the usual Juddmonte depth. Her dam Kerali was out of a top-class juvenile in Sookera, a Cheveley Park Stakes winner bought from Robert Sangster. Mockridge assumes Sookera to be the source of speed in Hasili’s stock, as Kerali was by High Line and Hasili herself by Kahyasi. Kerali's first foal Dissemble was sold to Brazil, where she produced no less a horse than Leroidesanimaux, sire of Animal Kingdom; and Hasili herself was entered for the Tattersalls December Sale after winning four times as a juvenile for Henri-Alex Pantall. Luckily she was withdrawn; still more luckily, Prince Khalid included Hasili among those mares he sent as a gesture of faith in a horse he did sell, Danehill, at his new home in Ireland. The result was Dansili, second in four Group 1 races but never beaten so narrowly as when careering into third on his final start, in the Breeders’ Cup Mile. It is staggering to think a horse as celebrated as Dansili, who started his own stud career at £8,000 and has since peaked as high as £100,000, should have prevented his dam from claiming outright a record she instead shares with Eight Carat, responsible for five top-tier winners in Australasia. As it was, four subsequent foals by Danehill – Banks Hill, Intercontinental, Cacique and Champs Elysees – all formally made the grade, along with Hasili’s daughter by Green Desert, Heat Haze. Her only other starters were Storm Cat’s daughter Deluxe, who went down by just half a length in the Prix Saint-Alary before winning a Grade 3 in the US; and the once-raced Sadler’s Wells colt Raise The Flag, who recently sired his first stakes winner in New Zealand. To Mockridge, it is precisely Hasili’s lack of flamboyance – her freedom from mental quirks or physical extravagance – that qualified her to amplify the stellar qualities of her mates. “Danehill was selected as a mate purely and simply because he was such a very strong horse,” he says. “She was just a vessel. She allowed Danehill to dominate, she allowed Green Desert to dominate. And Dansili was an incredibly robust first foal, a big forceful character. The situation is much the same, then, as with a jug. Fancy design and ceramics are all very well – but not if the base is too narrow and you can knock it over easily; or the sides are full of fissures; or the lip does not pour cleanly. The transmission, through Hasili, has had no deviation, no wobbles. As such, her sons have distilled the greatness of Danehill, as a sire of sires. Mockridge speculates it must be nearly unique for the same stud to stand three full brothers, albeit their respective fortunes here admittedly diverged considerably. “To look at, colour-wise and markings-wise, Dansili and Cacique are nearly identical,” he says. “But their physiques are very different. One looks a miler, strong and robust; the other has a bit of extra stretch, and looks a middle-distance horse. Incredibly, from Cacique’s first crop of just 29 foals, three became Group 1 winners. But if mare owners can be forgiven for being chary of booking Cacique, their treatment of Champs Elysees would seem more culpable. He is now seeking a fresh start at Castlehyde Stud as a National Hunt stallion, in which role he could very well emulate the success of another Juddmonte graduate in Beat Hollow. Yet his exile has struck many as a depressing measure of the fast-buck vices besetting commercial breeding today, when pubescent colts are retired from the track after six months to receive mares by the hundred. Now that so many people are trying to breed yearlings, rather than racehorses, Champs Elysees had the commercial recklessness to sire hardy, progressive animals like Ascot Gold Cup winner Trip To Paris, who improved his rating with time and distance from 76 to 116. “Once a horse has been pigeon-holed, you just cannot change perceptions with breeders,” Mockridge sighs. It must be conceded that Hasili’s daughters also have a fairly chequered profile in their own breeding careers. Banks Hill has produced a Group 1 winner and Breeders’ Cup runner-up by Galileo, in Romantica, as well as Ideal World, a son of Kingmambo who has sired a triple Grade 1 winner in South Africa. And Heat Haze has a promising three-year-old with Sir Michael Stoute in Mirage Dancer, a son of Frankel who won his sole start to date at Doncaster last autumn. But it would be a typical paradox of the breeding business if they were surpassed by the unraced Responsible, Hasili’s last foal in 2011. The daughter of Oasis Dream produced an “exceptional” Frankel filly last year and has just delivered a brother to that first foal. “Who knows?” Mockridge says. “It could be the daughter who didn’t put her energy into racing that turns out to be the one who puts it best into her stock. It’s the unknown, of course, that makes it all so interesting. You can never predict how things will unfold – lots of things go into the mix. “We’re fortunate Prince Khalid is not governed by fashion, which is definitely a good thing. At the end of the day, he is trying first and foremost to breed a racehorse; and, ultimately, a Classic winner. So it’s vitally important to have a team on board, as we do here, to give sound pedigree advice. Juddmonte continues to enjoy a productive time on the racecourse.Arrogate won the Pegasus World Cup and Dubai World Cup earlier this year. In Britain, the outfit has a front-line Oaks candidate in Shutter Speed, while in the US, Paulassilverlining, who was recently bought to visit Arrogate when he retires to stud, won her second successive Grade 1 race on Saturday since her purchase by Juddmonte. 1 Prince Khalid Abdullah is a member of the House of Saud, the royal ruling family of Saudi Arabia. The son of Abdullah bin Abdul Rahman, younger half-brother of the state's founder King Abdulaziz (Ibn Saud to westerners), he was born in Ta'if in 1937. He is a cousin of the present ruler, King Salman. Prince Khalid's first wife Al Jawhara bin Abdulaziz is the founder's daughter; the late Fahd Salman, who owned 1991 Derby winner Generous, was his son-in-law. His full name is Khalid bin Abdullah bin Abdul Rahman bin Faisal bin Turki bin Abdullah bin Muhammad bin Saud bin Muhammad bin Muqrin Al Saud. 2 Before embarking on a hugely successful business career, Prince Khalid studied history in Riyadh and the United States and was also employed in the Saudi Ministry of Foreign Affairs. His main business vehicle is Marawid Holding, a private investment company with extensive dealings in a vast range of commercial activities, including financial services, telecommunications, satellite TV and radio networks, construction, catering and restaurants. In 2015 Bloomberg estimated his net worth as at least $1 billion; another survey last year suggested $1.8bn, although such figures cannot be verified. 3 Abdullah is renowned for being a courteous, unassuming individual, preferring to be identified as Mr K Abdullah on racecards, but also guarded when it comes to revealing much about himself. The late Humphrey Cottrill, the former trainer who became Abdullah's first racing adviser, once said: "He was always perfectly charming but, even after some time in his company, I knew absolutely nothing about him as a person." 4 In a rare interview with the Racing Post's David Ashforth in May 2002, Abdullah revealed that his famous racing colours matched his curtains. "I like to see my colours from a distance and I have a problem with my eyes," he said. "When I decided to buy horses, Lord Weinstock visited me and said, 'You don't need to find colours, these are your colours', and he pointed to the curtains – the green, and white, and pink. He chose the colours for me." 5 Abdullah's life as a racehorse owner did not begin in auspicious fashion when the first batch of four yearlings bought by Cottrill on his behalf at Newmarket in 1977 proved to be duds as two-year-olds. Sent to his first trainer Jeremy Tree, three ran and none won in their juvenile season. In 1978 Abdullah went to a record 264,000gns to purchase the highest-priced yearling at Tattersalls Houghton Sale; named Sand Hawk, he eventually won only one small race. 6 Abdullah's first winner was Charming Native (trained by Jeremy Tree) at Windsor on May 14 1979, a month before Abeer became his first Royal Ascot winner (also first Group winner) in the Queen Mary. Known Fact, a son of In Reality bought at Keeneland in 1978, became his first Group 1 winner in the 1979 Middle Park; when the same colt claimed the 2,000 Guineas the following season after the disqualification of Nureyev, he became the first Classic winner to represent an Arab owner. 7 Abdullah is on record as favouring the breeding side of things above racing but rumours of a cutback – owing to his age and lack of enthusiasm from his sons – have been rife. A recent 'consolidation' cut his worldwide broodmare band to about 200; he also sold two stud farms comprising 1,500 acres, including the original base of Abdullah's Juddmonte bloodstock operation in Wargrave, Berkshire. 8 Although Guineas winners Known Fact and Dancing Brave were not homebreds, Wince's victory in the 1999 1,000 Guineas for Henry Cecil completed a nap hand of Classics for Juddmonte, which is based at Banstead Manor Stud near Newmarket. That Classic-winning list features three Derby winners – Quest For Fame (1990), Commander In Chief (1993) and Workforce (2010) – plus Abdullah's masterpiece Frankel, who won the 2,000 Guineas in 2011; Juddmonte also bred Brian Boru, the Coolmore-owned Leger winner in 2003. Homebreds have also won all five French Classics carrying the Abdullah silks. 9 The late Bobby Frankel, who provided the inspiration for the naming of the legendary Sir Henry Cecil-trained performer, landed a host of major US races for Abdullah, often via former European-trained horses switched across the Atlantic in the later stages of their racing career, among them Epsom hero Quest For Fame, Exbourne, Beat Hollow and Banks Hill. 10 Following Bobby Frankel's death, Cigar's trainer Bill Mott became Abdullah's US man, since when Bob Baffert – trainer of world champion Arrogate, who became the all-time leading money earner with his stunning Dubai World Cup triumph – and reigning US champion Chad Brown have also joined the team. Brown trained Flintshire in 2016 and now has Time Test, who was touched off earlier this month at Belmont on his five-year-old debut. Having rightly done some Group 1 celebrating after Enable's Arc victory, Frankie Dettori was in flying form at Tattersalls sales last week, with one regular describing him as "bouncing around like Zebedee". That is Zebedee as in The Magic Roundabout, not the stallion whose bouncing is of a rather different nature. But we should all be fitted with a whacking great spring in our step at the news Enable is to stay in training next season. It will shorten the winter. You would expect nothing else from Khalid Abdullah's Juddmonte operation. Abdullah has proved some adornment to Flat racing and trainer John Gosden is simply in awe of the manner in which his bloodstock empire has evolved to the superb in a mere 40 years. The phrase "from a Juddmonte family" carries real clout in the bloodstock world and needs no elaboration. Enable is a filly of magnificence who does not merely win but trounce. She travels, has several turns of foot and can do it on any ground from the hard shoulder of the M5 to Grimpen Mire, soggy and boggy home to the Hound of the Baskervilles. Enable's margins of victory have been stupendous and without her Aidan O'Brien would have won all ten British and Irish Classics this season. Ballydoyle provided the runner-up in both Oaks. It was that great and kind prime minister Harold Macmillan who coined the expression "never had it so good", and it is true of all of us who love their racing in the here and now. Over the last eight years we have been blessed with Sea The Stars, Frankel and Enable. Three London buses of undoubted brilliance all coming round the corner at once. Now our luck is going to hold for a fresh season with another helping of Enable, a veritable titan of a filly. Good luck and godspeed. When you have scaled the highest peaks, as Prince Khalid Abdullah has with his Juddmonte Farms, it must be difficult to conceive of new challenges. The man who raced Dancing Brave in 1986 must have thought he had reached the summit of thoroughbred ambition. 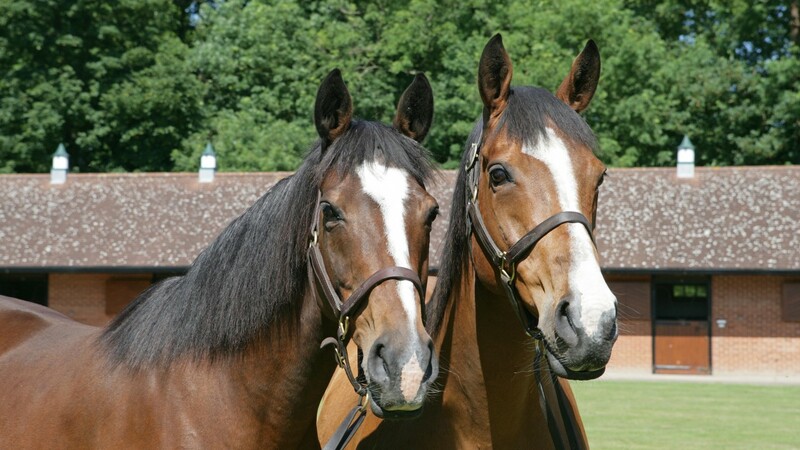 Then along came the genetic masterpiece that was Frankel. What can the post-Frankel era possibly bestow to keep Abdullah in thrall? Well, there’s Enable’s bid to win a second consecutive Prix de l’Arc de Triomphe for him to contemplate. That would be no mean feat, yet for breeders of Abdullah’s hue the allure always lies beyond the next mountain. So when the dust settles over Enable’s quest at Longchamp on Sunday, Abdullah might retreat to his Parisian townhouse and contemplate a filly who was foaled seven months ago at his Banstead Manor Stud in Newmarket. The filly is a full-sister to Frankel, the only one of her kind, and just the second filly that Kind, the broodmare who is now 17, has bequeathed him. That’s the beauty of what Abdullah, 81, has created with Juddmonte. In an apt parallel, the man of royal Saudi roots has unearthed a fertile oil field in which just about every exploratory probe releases torrents of black gold. There is simply no telling which of his regal broodmares will deliver the next champion. And for Abdullah, the most rewarding dividend is that he created the blueprint himself. Erskine Crum is best placed to recognise Abdullah’s input into Juddmonte, which embraces five stud farms in Europe and three sizeable adjacent pastures on the outskirts of Lexington in Kentucky. His appointment as CEO more than five years ago saw him assume many of the responsibilities Abdullah had personally overseen since he bought his first racehorses in 1977. Among other things, he has learned that Abdullah’s attention to detail is fastidious. If time’s passage required Abdullah to seek a helping hand, however, his own hand is still on the tiller. “If there is a decision to be made, I will make a recommendation to him based on what our people feel, and he will either approve it or not,” Erskine Crum says. Erskine Crum’s brief extends solely to Juddmonte but the mechanics of how Abdullah achieved prominence through his successful business interests are well documented. In 1968 he established Al-Mawarid Holding, the parent company that now presides over commercial ventures as numerous as they are diverse, and in which his sons play an increasingly prominent role. Abdullah is described as unequivocally the most successful private businessman in the royal House of Saud. Through his global professional reach he absorbed the principles of best practice and applied them rigorously to his breeding and racing interests. Like all new entrants to ownership, he bought his first horses at public auction – his first winner, Charming Native in 1979, was ridden by Lester Piggott – but it wasn’t long before the concept of Juddmonte took shape in his mind’s eye. Abdullah’s female families have made him an owner-breeder without peer in Europe over the last three decades – and with few peers in the US into the bargain. He has achieved this with fewer numbers than other like-minded middle-eastern potentates. At 800, the head-count of all his horses – stallions, mares, racehorses and young stock – is fewer than Sheikh Mohammed and his entourage have in training alone. Elegant trophy chests in the Banstead Manor offices groan under the weight of silverware that includes homebred winners of each of the five British Classics, which were annexed within ten years of Juddmonte’s creation, and all five Classics in France. All told, Juddmonte has bred 26 Classic winners in Britain, Ireland and France. And the emphasis on homebreds – as opposed to all horses that raced in Abdullah’s silks – is such that Dancing Brave’s 2,000 Guineas triumph in 1986 goes unrecorded on the Juddmonte website for the fact that he was bought as a yearling. Juddmonte Farms today embraces some 200 broodmares, which deliver superior horses in such quantity that supplementing them with racing stock bought at public auction is surplus to requirements. But the farm’s achievements are not just down to its equine residents. There's an organic theme to the staff. “Everyone who works for Juddmonte works for one man – Prince Khalid – not the company,” Erskine Crum says. “There is an underlying, fundamental loyalty towards him. There is no denying that a slice of good fortune is prevalent in the success of Juddmonte’s foundation mares. Bloodstock agent James Delahooke was responsible for acquiring most of them, although Abdullah arrived on the scene in 1977 with horses bought by Humphrey Cottrill and trained for him by Jeremy Tree. Cottrill had outlived Tree by six years when he died in 1999, yet to this day Abdullah treasures his memories of both men. Their early auction-ring restraint made the perfect foil for an impetuous prince who wanted to engage with the sport in double-quick time. Abdullah had waited long enough. His love of racing crystallised in 1956, when he visited Longchamp frequently with friends while living in Paris. Although he resolved there and then to take out his own silks, 21 years would pass before he felt the time was right. Since then Abdullah has relied on the same continuity among trainers as from his stud personnel. The longest-serving is John Gosden, who has trained for him since the early 1980s, when Gosden was based in California. At that time Abdullah sent horses who came up narrowly short in Europe to the west coast, where Gosden enjoyed success with the likes of Grade 1 winners Bel Bolide and Alphabatim. Gosden, who trains Enable, has been on the Juddmonte books for 35 years. That is only marginally longer than Andre Fabre, who trained all the progeny of Juddmonte’s supreme matriarch Hasili, among them Dansili and Banks Hill – the latter Abdullah’s first Breeders’ Cup winner in 2001. A little window into Abdullah’s methodology opened up in 1987, when Gosden moved his training operation from California to Newmarket. Gosden’s replacement was chosen on entirely performance-related grounds. The nod went to Bobby Frankel on the evidence of reams of computer-generated data that highlighted Frankel’s prowess – albeit with horses of modest ability. 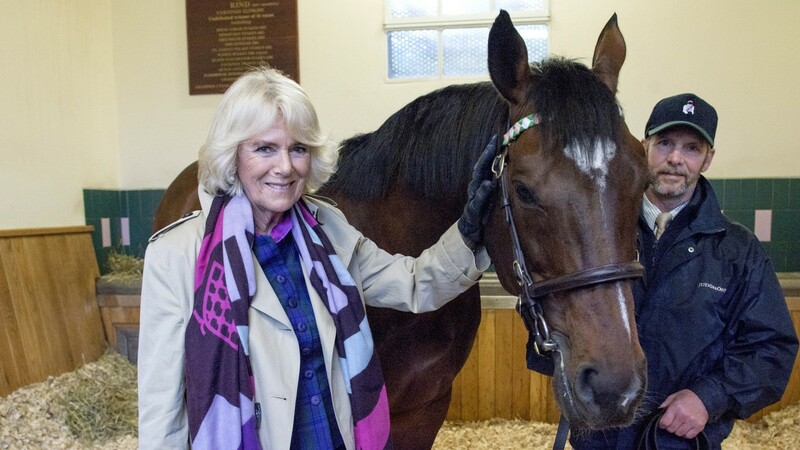 Frankel had never met his new patron before Juddmonte’s first batch of horses arrived in his stable. It was the start of an instantly fruitful relationship that saw Frankel unleash a flurry of Grade 1 winners on turf to go with dirt stalwarts such as Belmont Stakes winner Empire Maker. Frankel continued to train while he battled with lymphoma, a form of blood cancer, although in later years he had passed on virtually all his horses except those he trained for Abdullah. The alliance between the two men was based on mutual respect, although Abdullah’s appreciation of Frankel’s training prowess was such that, when Frankel died in 2009, he named his best young racing prospect in the trainer’s memory. It was an act of providence fully deserving of what the fates bequeathed. As the world now knows, Frankel the racehorse was trained by Sir Henry Cecil. And in a shocking reprise, Cecil was to fight his own debilitating battle against cancer, which eventually claimed him in 2013. Abdullah’s indirect prompting almost certainly helped to prolong Cecil’s life. With Frankel in his pomp, it was easy to forget that Abdullah had stood steadfastly behind the man whose magnificent career went into steep decline at the turn of the millennium. And when Frankel emerged to remind the fickle of Cecil’s unique talent, Abdullah kept the horse in training – and Cecil’s flame of hope flickering – as a four-year-old. The decision overrode the Juddmonte precedent of retiring their very best colts at three. So what of Abdullah’s own legacy? It’s a question that has preoccupied the chattering classes for some years now – and no wonder. Juddmonte is the prize diamond among thoroughbred nurseries worldwide. Although it proved unfounded, the suggestion three years ago that it might be for sale sparked frenzied speculation that took forever to abate. It was as if the Louvre had put its entire art collection up for auction. Such speculation is abetted by the fact that there is no obvious heir to Juddmonte among Abdullah’s sons, although two of them – Prince Ahmad bin Khalid and Prince Saud bin Khalid – are occasional visitors to the races when one of their father’s best horses steps out. Each of them was on hand to witness Enable win last season: Prince Ahmad for the King George VI and Queen Elizabeth Stakes and Prince Saud for the Arc at Chantilly. Abdullah himself has visited Longchamp more than once since it reopened in April, which lends encouragement that he may be on hand for Enable’s repeat Arc bid on Sunday. Beyond that, however, the only thing certain, in time-honoured Juddmonte fashion, is that the eventuality will have been planned for. Although not reclusive, Abdullah does not care for the media spotlight. Much of his modus operandi has been pieced together from decades of turf involvement, over which time distinct patterns have emerged. This sometimes leads to assumptions being made, yet there can be little doubt as to why Cecil, who meant as much to Abdullah as anybody in racing, has not had a Juddmonte homebred named in his honour – as Bobby Frankel had before him. The answer can almost certainly be traced to Abdullah's discerning character. He knows well that the best-laid plans in racing often come to nothing, that an element of good fortune is obligatory, and that the success of Frankel the racehorse was probably propelled by divine velocity. He is also wise to the perils of tempting fate for a second time. Enable's little half sister by Dansili, Entitle, broke her duck last night on on the all-weather at Lingfield. This was her second race start. Like her champion sister, Entitle races for her breeder, Juddmonte Farms. She beat Betty Windsor's Equal Sum narrowly, with a margin to the 3rd horse.